“While water boards continue to insist their water is safe (why wouldn’t they? ), and write off such ‘scaremongering’ as a ploy to create problems to sell water filters. Some of these are the same water boards tipping industrial poisons into the water supply and convincing themselves they are doing the public a service, such is life” says author and Health researcher Phillip Day. There are at least nine kinds of water. Hard water, Boiled water, Raw water, Soft water, Rain water, Snow water, Filtered water, de-ionized water and distilled water, only one of these nine is good for you. Some kinds harden the arteries, form gallstones & kidney stones, bring on early senility and a host of other diseases. Spring water contains a reasonably high mineral content, right? Yes,( 250-400ppm) but unfortunately, minerals, which the body is unable to use! This kind of water is non-ionised and inorganic, making it impossible for the body to assimilate. converts this in-organic material, to organic, which is easily assimilable to our bodies. A simple test of the water,with a TDS metre will demonstrate this hidden matter, as these minerals and pollutants will become visible. When I first saw this experiment demonstrated on several different kinds of water, I could not believe my eyes as to the ugly mass of debris sitting in the glass! That is, what we actually drink? If you thought drinking spring water was good for your health, then you have been misled. These inorganic minerals end up as sludge in our systems that the body has to deal with, along with the rest of the pollutants. The body often needs to deposit these useless minerals in the joints, and one can take this simple test by simply rotating your head in a circle, the grinding noise you may hear, is said to be that of these mineral deposits. Bottled water may not only prove to be expensive, but there is always the doubt as to what water you are really getting (after the highlight of recent scandals!) It is also advisable to avoid plastic bottles, especially the flexible ones, which contain plasticiser chemicals which mimic the female hormone estrogens. They really were designed to be disposable, don’t re-use them. “Carbon filters are good at removing most of the chlorine in countries like America and Canada where the water is heavily polluted with this halogen. You may end up with tastier water, but any fluorides, heavy metals, hormones and micro-organisms remain untouched” says Phillip Day. Reverse Osmosis is the choice of many, “and is used today for manned space programs, desalination of sea water as well as use in heavy industry where the purest, most stable water is required”. Day goes on to say “the process of reverse osmosis forces water with a greater concentration of contaminants(the source water) into a tank containing water with an extremely low concentration of contaminants(the processed water). High water pressure on the source side is used to reverse the natural osmotic process, with the semi-permeable membrane still permitting the passage of water while rejecting most of the other contaminants”. While this process removes a cross section of harmful contaminants, it is not efficient in removing Algae, Bacteria, Crypto Sporidium, Viruses (Gardia etc) and I believe it wastes a lot of water in the process ( 4-5 gallons to treat 1 gallon) and the price may not be affordable to most families. Distilled water- I personally believe is the most economical, practical way to go. In distillation, the water is boiled, evaporated, then the vapour condensed, thus removing all the solvents and leaving pure water. Originally I payed $350 to purchase a Genie Mk 11 home distiller.It was a good product until I blew it up by getting water in the plugs oops! 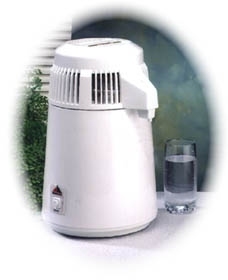 That was some years ago, now there are the same unit for lesser price, for just around $269 (postage included) you can get started with pure water. After the initial outlay, this proves to be the most inexpensive way to acquire pure, clean water. See healthstart appliances. Physicians rarely promote the curative properties of H2O but Dr Batmanghelidj, M.D. has studied waters effect on the human body and has found it to be one of the best pain relievers and preventative therapies in existence.He amazingly witnessed water, when no other medicine was available; in just several minutes eradicate excruciating pain! Not once but thousands of times over. “Pain is a sign of water shortage in the body, and water shortage is actually the background to most of the health problems in our society” says Dr B. 'Water'- Our cheapest health insurance!